There were pre-concert nerves and one or two tricky moments when manoeuvring the bands backstage but nothing the host and the group helpers couldn’t handle. 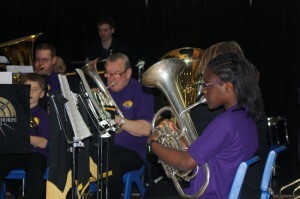 As they took to the stage, the instrumentalists from The Skelmanthorpe Training Band looked resplendent in their new purple uniforms and undaunted by the size of the stage and the devoted audience, soon settled into their programme. The performance was outstanding and the group will no doubt follow in the accomplished footsteps of the two other bands within its brass band community. 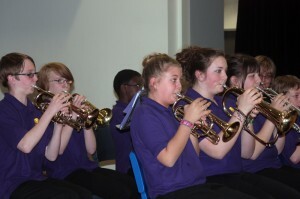 The second concert was hosted by Skelmanthorpe B Band at Scissett Middle School in January of 2012. With pre- performance nerves now under control, the Training Band performers were again on fine form and set a first-class example for the other training bands to follow – not only in the level of musicianship but also their professional conduct on stage. Acting as host of the final concert at Stocksbridge High School, was Deepcar Brass Band. Once more Skelmanthorpe Training Band led the way with an uplifting performance and a level of appropriate behaviour both on and off stage, to which the other training groups could only strive.